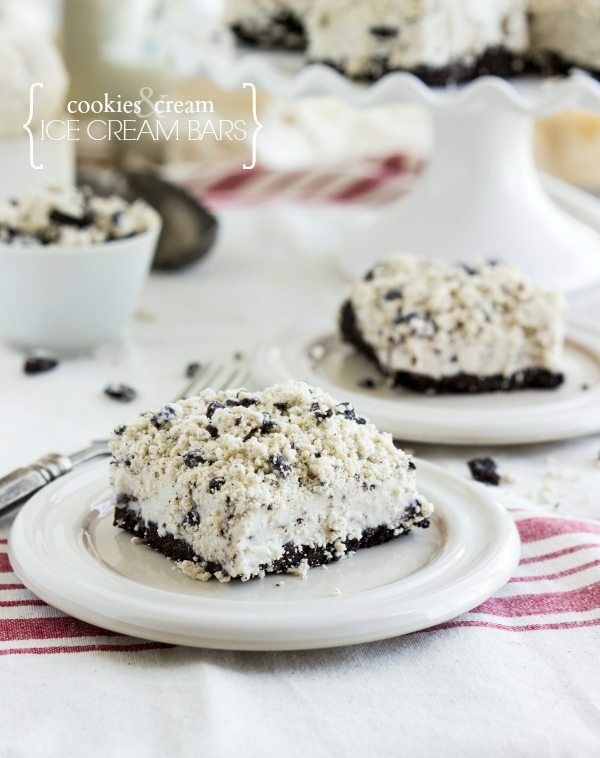 Cookies and cream ice cream bars – a dessert inspired by the famous Oreo Good Humor Bars. These dessert bars are easy to make, ready in less than an hour (including freezing time! ), perfect for a hot summer day, and sure to please a crowd! 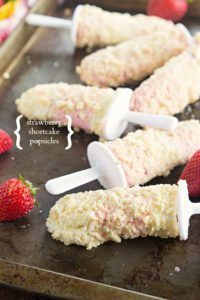 So, for those of you that liked the Oreo version better than the Strawberry Shortcake version (I’m talking Good Humor dessert bars here), I’ve got you covered. After I made the strawberry shortcake ice cream bars, I was left with a serious craving for an oreo treat. And…truth be told, the oreo version was always my favorite. Although I do recognize these aren’t in a popsicle form like the Good Humor bars I referenced, these are even better. 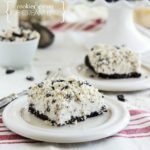 They start with a thick oreo crust, and don’t worry, this recipe does NOT require you to separate the cookie from the cream in the oreo (Score!). The middle? Just cookies and cream ice cream – whatever brand is your favorite and you could even make cookies and cream ice cream from scratch – totally up to you! Finally, the crumbly topping? This is my favorite part of the whole thing. And, I don’t mean to brag, okay…I guess a little, but I am pretty proud of it. It took me quite a few tries with random ingredients and I was SO excited when a topping not only worked out, but was a drop-the-spoon, and just shove-the-bar-in-your-mouth-delicious. Yes. Spoons are not required for these bars. Line an 8 x 8 baking pan with parchment paper or foil. Make it so the parchment paper (or foil) hangs over the pan for easy removal of these bars. Set aside. In a large bowl, combine both Cookies and Creme Oreo mixes (totally dry) with the butter, and flour. Stir and mash the ingredients together with forks or with a pastry cutter until crumbs are created. This takes some time and patience if you are using a fork, but it will get to a crumb consistency. Lay the crumbs evenly on a large baking tray and place in the freezer while preparing the other layers. In a blender or food processor, pulse the oreos (with the white cream filling left inside) to a crumb consistency. Stir in the white sugar and melted butter until all ingredients are well combined. Press the oreo mixture evenly into the bottom of the pan. Soften the ice cream by leaving it on the counter for about 7-8 minutes. You do not want the ice cream to get too soft or unmelted or it becomes icy when unfrozen. 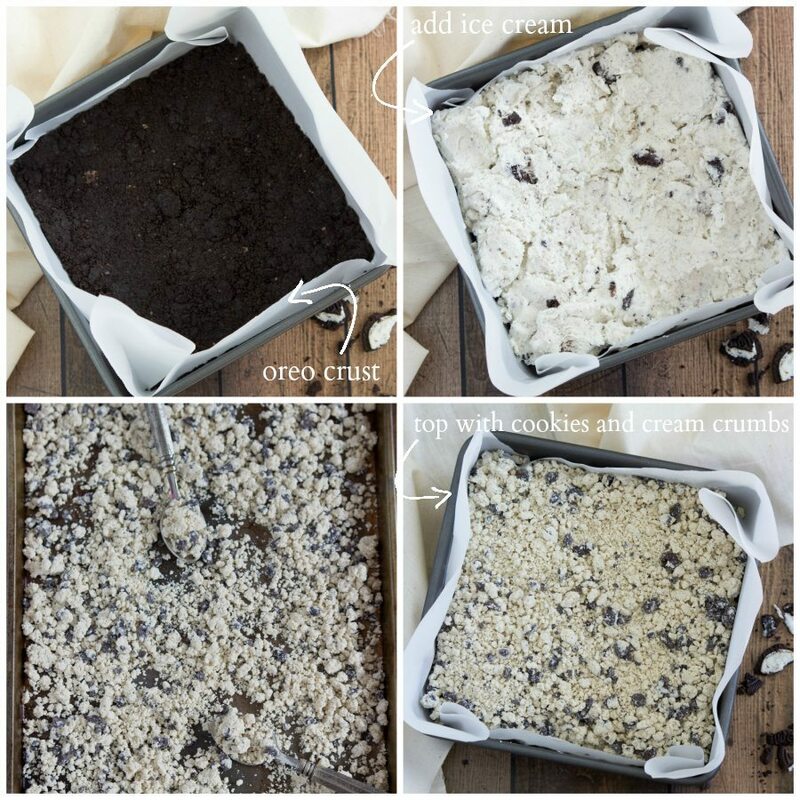 Press the ice cream on top of the oreo crust. You can put as much or as little as desired (I used 3 and 1/2 cups) but totally up to you if you want more or less. Remove the crumb topping from the freezer and sprinkle evenly over the top of the ice cream. Press the crumbs down into the slightly melted ice cream. Cover the pan with plastic wrap and place in the freezer to harden, about 30 minutes (or longer if you used softer ice cream). Remove from pan, cut, and enjoy immediately. Return any leftovers to the freezer. I don’t like Oreos, unless they are golden Oreos. UNLESS they are used in a different way (like the cookies and cream chocolate bars) It is getting HOT in Fl, so these are calling mah name! Pinned! Lovely sweet treat for summer! Uhhh this looks AWESOME And now I absolutely must make this. My husband lovesssss oreos so he will go crazy for this! Oh how gorgeous! You are brilliant my friend! This looks AMAZING! Easily the best ice cream dessert I’ve seen in a long time. And the crumb topping adds the perfect touch! Pinned! Love that crumb topping! Easy desserts like this are the best! Oh dear, these are gonna force me to invest in that 2nd bathing suit cover! Cookies & cream makes me weak in the knees! Cookies and cream is my favorite! These sound marvelous! Oh my gosh Chelsea! Could these be any more beautiful? You are seriously making me crave this right now! Chelsea, these look fantastic! That crumb topping has me drooling, it’s been way too long since I’ve had one of those Good Humor bars. I am definitely more a fan of the Oreo bars, so this is perfect for me! 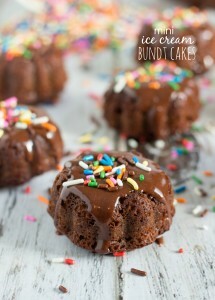 This looks so delicious, and I love how easy it is to make! Just what I need in the summer! Wow, thanks a lot Chelsea. Now I have to clean up all sorts of drool off my computer at work. Seriously?!?! Like, these bars are for real?! They look BEYOND amazing. I’m legit impressed, especially by those crumbs on top! YUM! Pinning! Chelsea! 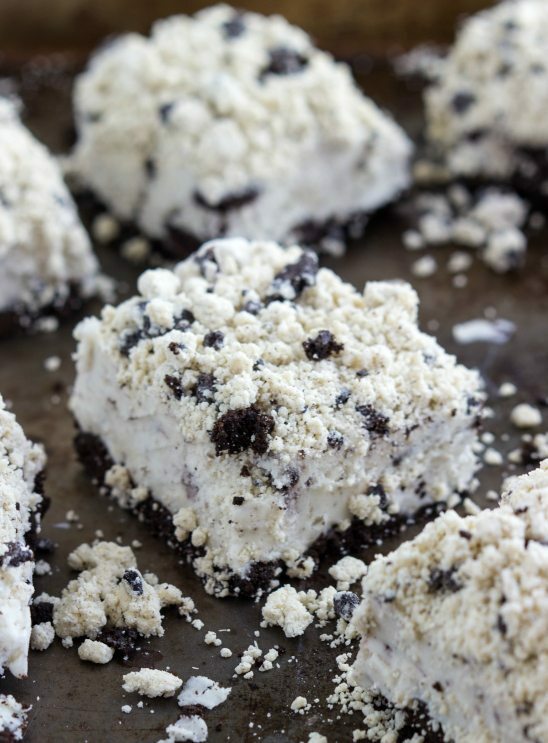 Oreo anything makes dessert better and these awesome bars are no exception! I could eat the whole pan… Great recipe with warmer weather. How have I never had any of those Good Humor treats?! I want one of these! I love how simple this is and I can’t imagine anyone I know who wouldn’t love this! Pinned! I want one right now! What a great summer treat. Pinning! Holy cow, these look gorgeous! 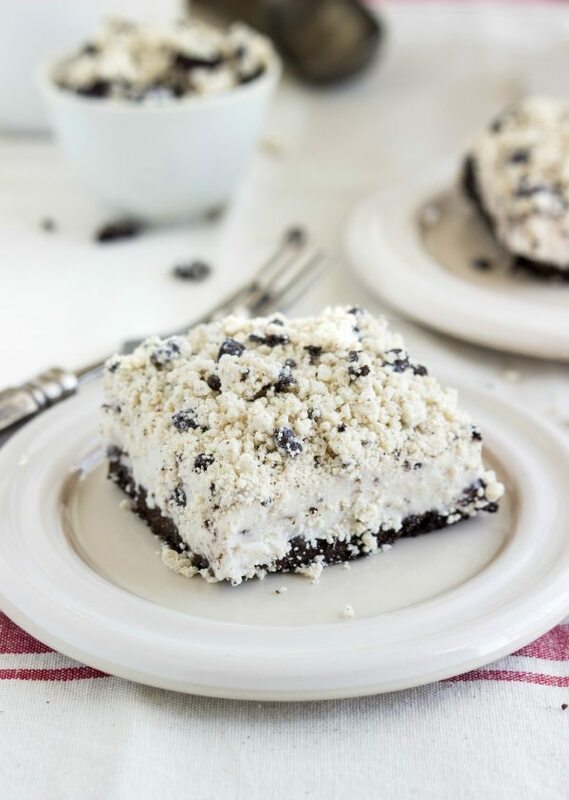 I am a total sucker for ice cream – especially cookies and cream and that crumb topping sounds amazing! I totally love what you created here!! 🙂 That topping completely sets them over the delicious edge! Pinned! Ice cream bars?! Love this idea! And cookies and cream is my favourite! Chelsea, does it matter what kind of cookies and cream mix is used for the crumb topping? It looks like Jell-O makes a pudding/pie filling and a no bake cookies and cream. I think both come as dry ingredients. Thanks! Hi Steven! For the crumb topping use the pudding mix. They should each be 4.2 ounces. I’m not familiar with the pudding/pie filling so I’m not sure if that would or wouldn’t work. Here’s a picture of what they pudding mixes I used look like: http://www.soap.com/p/jell-o-instant-pudding-pie-filling-6-pk-205387 Thanks for the question! My son picked this out for dessert for our family Christmas dinner. It turned out really well and most people went back for seconds.